Unposted. Notice: Huge lump of tufa as lintel, two more as gateposts. Tufa outhouse on right and perhaps toilet on left. Fire from right room, 30 panes of glass in large windows. Posted 1917. Redcurrants in the front garden? Unposted. "Keeper's House, Via Yellia, Matlock"
Posted 1911 to Cleasby, Fulham Rd, London. Early charabanc pulled by four greys, driven by 2 coachmen in tall hat and boots. 15 passengers (6 ladies), 1 brakeman, and 1 onlooker. An old car stands by. 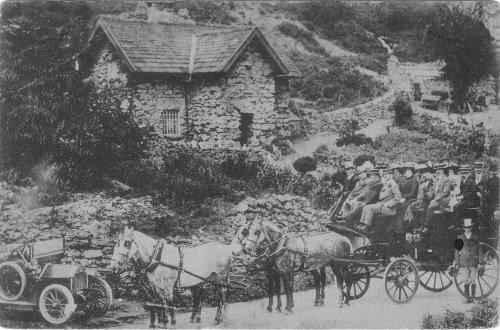 Presumably an organised day out, up Via Gellia, pausing for the cameraman outside Tufa Cottage. What a fine scene. OS ref: SK 2698-5678 A delightful cottage built of rough blocks of tufa, which has a very rough texture. 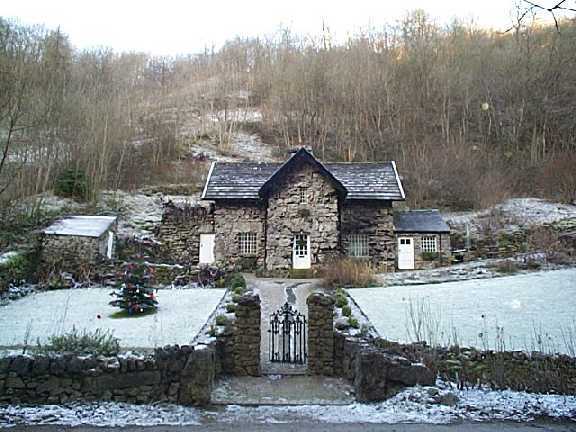 Originally a Keepers cottage, built about 1830. 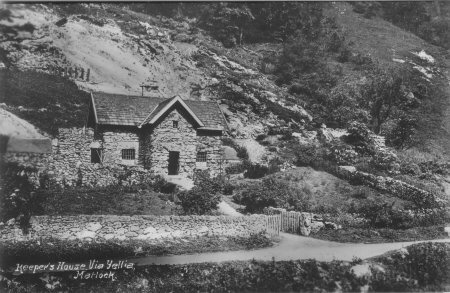 Also once known as "Marl cottage" and "Keepers cottage", it may be the only house in the country made of tufa. Sometimes called Via Yellia, the fabric called Vyella may derive from this. The present occupier tells me that the keeper's dogs were kept in a wire enclosure to be seen to the right of the photo, also that the keeper imported a special type of ant to feed his pheasants, the ants living in the sandy area to the left of the house. 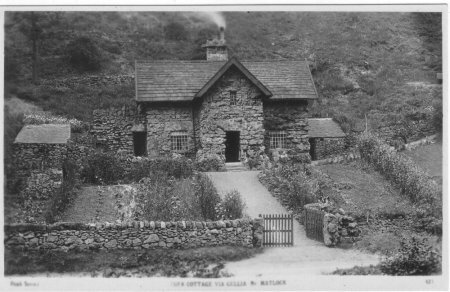 The occupier hopes to get a website going about the cottage shortly called www.Tufacottage.com Via Gellia forms the border between Bonsall and Middleton parishes, and Tufa cottage is just inside Bonsall. The following is the OS reference for the above taken from my very battered copy of the O.S. 1.25000 First Series, Wirksworth, Sheet SK25:- SK 269.567. 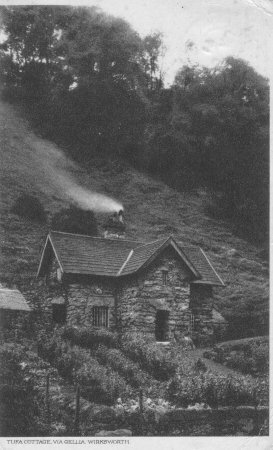 As one is travelling from Cromford westwards along the Via Gellia (after the Bonsall road turns off up the Clatterway) towards the Grange Mill crossroads on which the "Holly Bush" Inn is found, the cottage is sited at road level on the northern side of the Via Gellia, just before the very bad bend below Good Luck mine (on the southern side of the Via Gellia in Middleton parish). 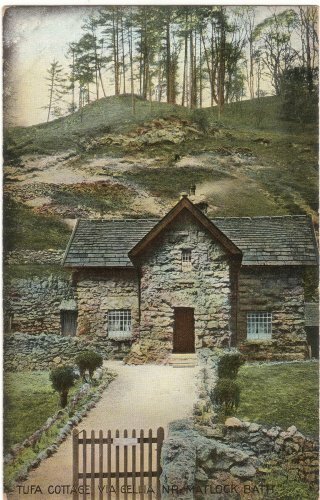 Northwards uphill from the cottage is located Dunsley spring, which presumably was used as a water supply to the cottage. This spring runs off the volcanic rock found on Bonsall Leys and was a source of water for Bonsall farmers living on Bonsall Leys. 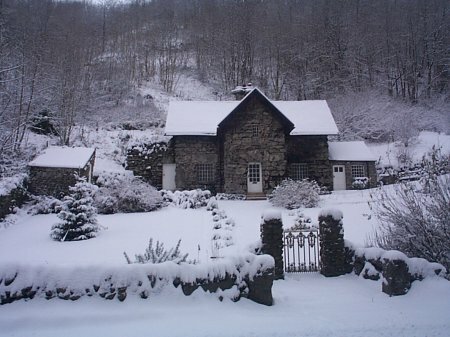 Some learned words about Via Gellia and Tufa Cottage. Tufa is a rough, thick, rock-like calcium carbonate deposit that forms by precipitation from bodies of water with a high dissolved calcium content. The continuity of the distinctive limestone plateau scenery of the White Peak is broken by a few deeply incised dales and by a wider network of shallower dry valleys. Although the valleys are water-cut features, most are now dry, providing evidence of a change in climate. During cold phases of the Ice Age, meltwaters from snowfields cut into the limestone surface forming valley features. When the climate changed, the volume of drainage water reduced and lacked the capacity for valley excavation. What little drainage remained now flows underground through cave and fissure systems, leaving a network of dry valleys. The Via Gellia is a steep-sided, narrow, wooded valley running eastwards from Grangemill to Cromford. Most of the Via Gellia is a dry valley, although it does carry an ephemeral stream in wet weather. 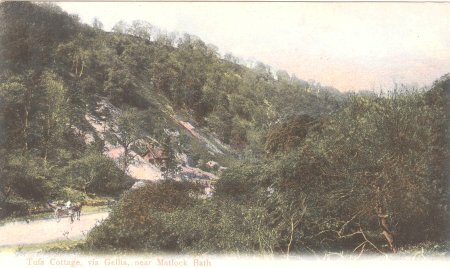 Its curious name 'Via Gellia', is thought to derive from the name of a local landowner, John Gell of Hopton, who first drove a road along the valley floor. Tufa-in-the-snow, taken about 2005 Unposted. The wooded, sandy valley side around Tufa Cottage.